The AAG Guild School of Art offers its members an up close and personal way to decide which workshops they want to attend. Guild members and their guests will meet the artists and view their art prior to the workshop at our monthly meetings. This year, our monthly program speakers, along with our current president, will be conducting workshops. Be sure to attend the AAG general meetings to get a taste of the presenting artist’s style and medium, in addition to finding out what’s in store for the workshop. Additionally, click on each presenters’ name to go to their website. 2018: August 10, September 14, October 11*, November 9, and December 14. Space is limited as this is a hands-on program. Participants are invited to bring their laptop, tablet, or smart-ph one. Bring digital images and information to edit, post on social media, or update your website. Topics covered: posting, creating events, sharing, boosting and other aspects of Instagram and Facebook, along with business tips and marketing strategies. Photo editing, management and other aspects of social media and marketing will be covered. Word Press webite and Blogging. Each session is driven by the needs of the attendees. 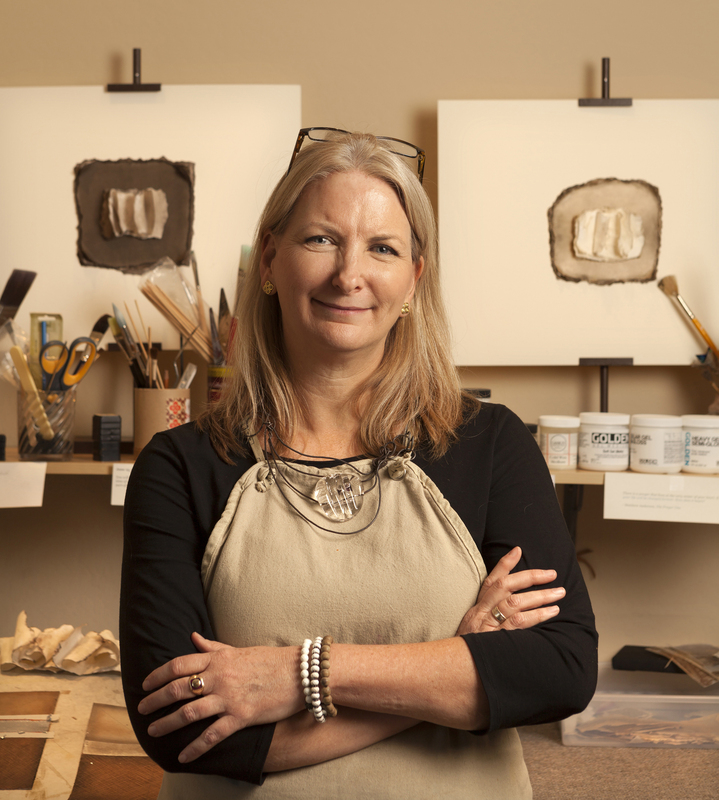 Tess Mosko Scherer has had two successful careers in the arts, first as a gallerist owning Scherer Gallery for 30 years, after which she launched her career as an artist with a vibrant studio practice. She generously shares her knowledge and insights in this ongoing program. Register by clicking on the Registration Form . Email info@arizonaartistsguild.net with questions. Pat Stacy would say “The tip of my brush is the tip of my soul.” Springing from an interior well, her work contains symbols attesting to a belief in life beyond what she sees and gratitude for life itself. Several of the symbols she uses are uniquely hers, while others are taken from a variety of cultures. Pat works in acrylic and mixed media on canvas and wood. 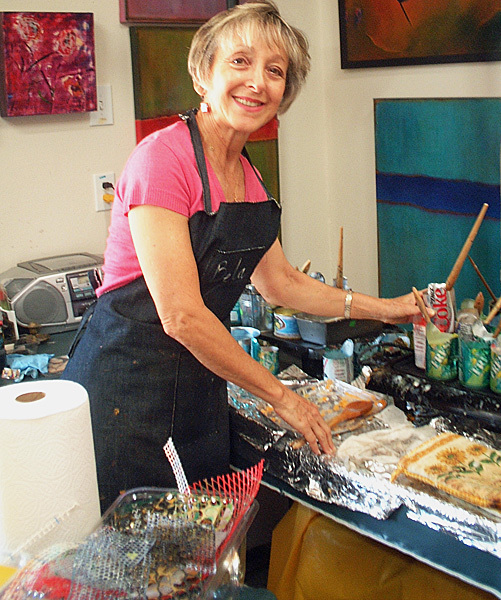 In 2008, Pat was at a crossroads in her life due to ill health when she picked up a brush, immersed herself in color daily, and found her passion for art. A native Arizonan, Pat’s work reflects her love of her Arizona heritage. Her unique Quadruvium series unites wood panels, heavy texture, fine line work, and her symbols. 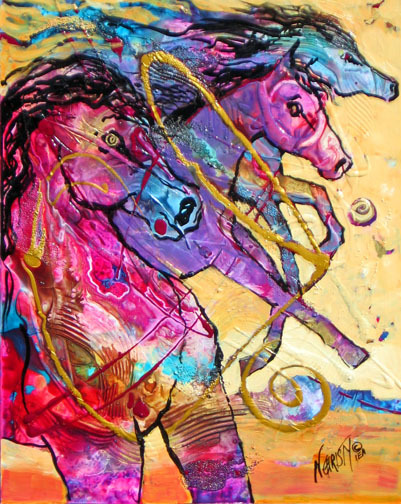 Her latest work uses metal acrylics with patinas and pastels to create a truly unique look on canvas and wood. 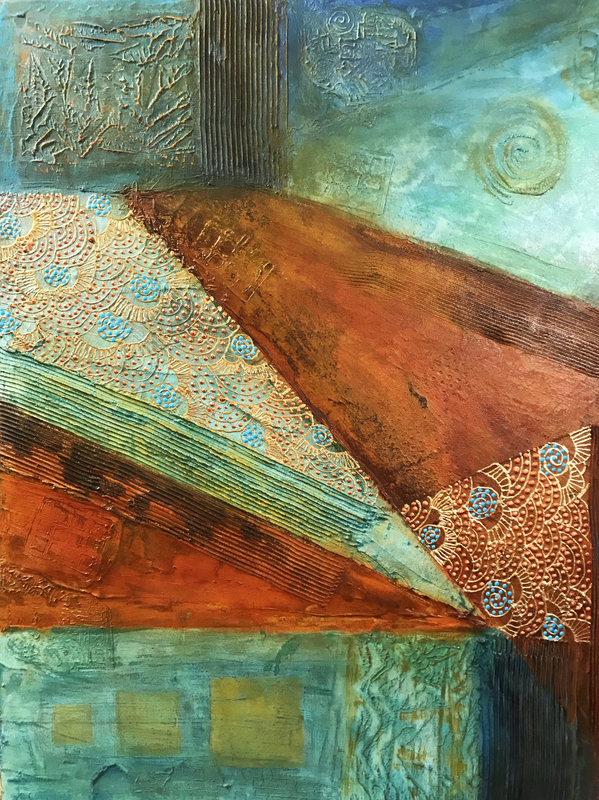 Pat is a juried, award-winning artist whose work may be seen in galleries in Arizona and Utah, as well as in the Arizona Fine Art Expo in the spring of each year. Join Nancy in this fun filled 2-day creative adventure with liquid acrylic paints or inks combined with various acrylic texturing elements. You will be loosening up and connecting with your creative flow, enhancing your creative energy while expanding your personal expression. Geared for intermediate and advanced watermedia artists. Day 1: Introduction to texturing and pouring paint with instructor demonstrations, followed by students’ experiments. Day 2: Discovering your painting’s direction and begin bringing it to resolution, ending with a short critique session to assess your progress. -to convey the Techniques or methodology that is uniquely theirs. Putting all those pieces together they learn to talk with different personality types and sell their work more effectively – be it to collectors directly or to galleries. -not sure what to say when you have a potential client in front of you. -understand the difference between talking for the sake of talking, and talking for selling. Tess Mosko Scherer owned and operated Scherer Gallery, a contemporary art gallery, for 30 years. She entered the gallery scene unexpectedly at 19 years old. Dealing with a sophisticated, successful, and often intimidating clientele, Mosko Scherer had to quickly learn how to overcome the obstacles of her youth and inexperience to build a successful business. In this workshop Mosko Scherer will share her H.E.A.R.T. approach to selling, giving you the tools to direct a sales conversation with confidence and clarity. This is an opportunity to become your best sales force, without feeling like the ‘slimy used car salesperson’. You will leave this workshop with a solid set of tools to approach your art sales in a way that is comfortable for you, and in alignment with who you are. Cost: AAG members: $65 | non-members: $75 | To Register click here. 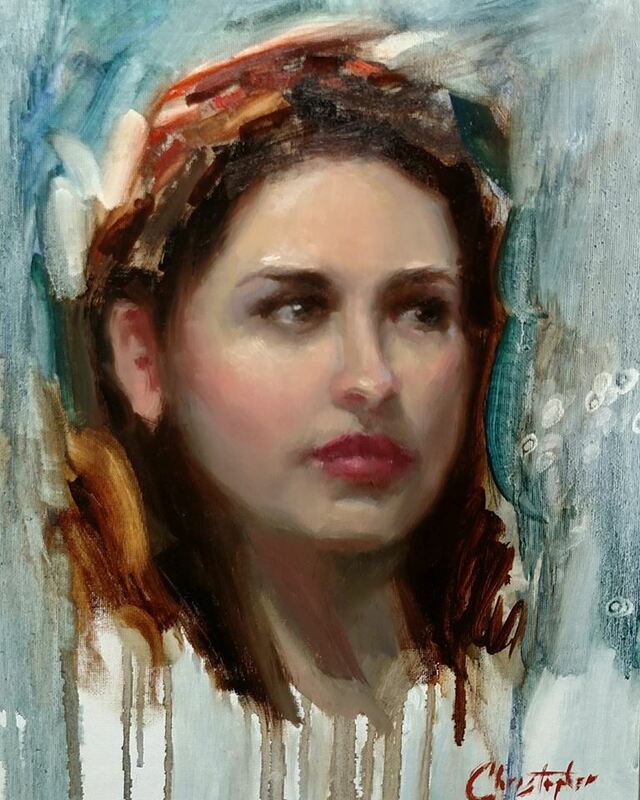 In this all day workshop, Mark will guide you through his process of painting a portrait from a live model. Covering lighting of the model, capturing the likeness and expression, and the importance of value and color to create harmony in your art. Using an alla prima approach to painting Mark’s technique focuses on the unique, emotional input of the artist and a sense of immediacy to guide the creation of each piece. You will learn masterful paint application techniques, tips and tricks for measuring the model, color theory as it relates to creating luminous skin tones, discovering what YOU want to say about the model, plus a whole lot more! Although Mark works with oil, acrylics are also welcome. A suggested supply list including color recommendations for both a full color or limited palette will be provided upon registration. Cost: AAG members: $65 |non-members: $75 | Click here to register. In this workshop, student will learn the important basics for painting with wax. The art of encaustic is an adventurous fun practice. The instructor will provide Equipment, Irons, Wood and Encaustics. Material fee of $30 per student due to the instructor on workshop day. Students bring collage materials: beads, glass, small jewelry, papers, etc. Plus apron, latex gloves, comfortable shoes and a sack lunch. Prepare yourself for a very fun-filled day! 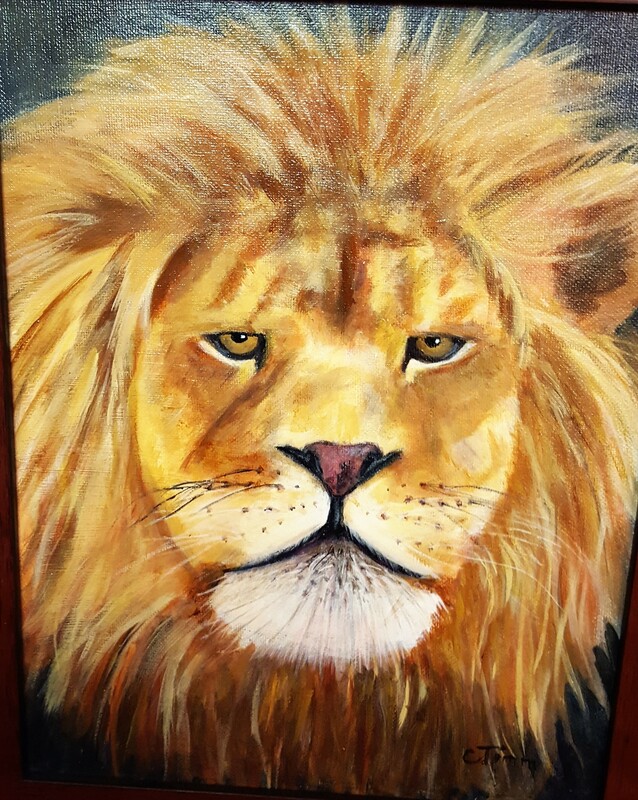 Lord Leo by Carmen Timm, workshop Chair for Arizona Artists Guild.